InstaSafe showcased its SDP Security Solution at recently concluded RSA Conference 2018, the Mecca of Cyber Security, and was well received with accolades for its technological innovation. Leading industry security specialists acknowledged the technological innovation of simple yet robust security solution to protect against new age cyber threats. The Bangalore Chapter of Cloud Security Alliance, chaired by Mr. Sandip Kumar Panda, the co-founder, and CEO of Instasafe Technologies, convened the CSA Bangalore Summit2018 at Vivanta by Taj, MG Road on 14th June 2018. The Summit focused on global governance, the latest trends in Cloud and Information Security, the changing threat landscape, security innovations like Software Defined Perimeter and the best practices to help organizations in the new frontiers of cloud security. The full-day event had a plethora of speakers who shared their thoughts on cybersecurity and next-gen enterprise security including GDPR policies and how to become well certified on certifications by Cloud Security Alliance. The speakers included : Dr. Hing-Yan Lee, EVP, CSA APAC, Mr. Ravikishor Mundada, CEO, Cybersecurity Center of Excellence, Dept of ITBST, Govt of Karnataka, Mr. Nikhil Bandi, CIO and Senior VP and CISO, Vistaar Financial Services, Mr. Biswajit De, Senior Technical Consultant, Trend Micro, India, , Mr. Vikas Mathur, co-founder of RightCloudz Technologies, Mr. Sudheesh Babu, GM & Head, Strategy-Cybersecurity & Risk Services, WIPRO, Suresh Agarwal, the Founder and Managing Director of Agarwal Pte Ltd. and Infotech Global Pte Ltd, Mr. Biju George, CTO & Co-founder, InstaSafe Technologies, Director of Research at CSA APAC, Mr. Haojie Zhuang and Mr. David Siah, the Chairman of Singapore Chapter and Head of Channel & Distribution (APAC, Middle East, Africa) of Trend Micro Singapore. Topics like cloud evaluation as a service, software-defined perimeter, risk-based approach to cloud security, cloud access security brokers, GDPR were thoroughly discussed on. The sessions also talked about how government initiatives are being taken up in our own country and worldwide on rising cybersecurity risks. The event ensured a collaborative association amongst all for a safe and secure enterprise functioning throughout. 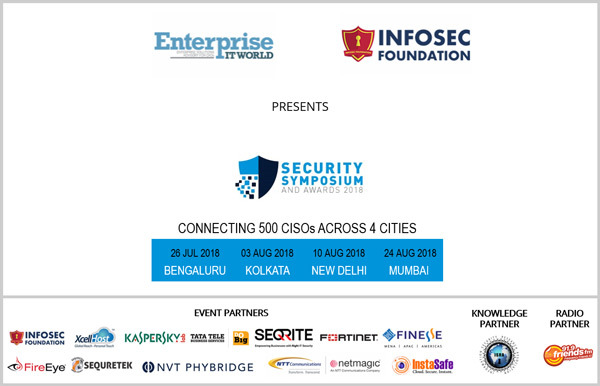 InstaSafe® is proud to be associated with the Security Symposium and Awards, 2018 as an event partner. So don’t miss the opportunity to meet us at our stall. We will be waiting!